Media coverage of the European migrant crisis often focuses on the migrants themselves—capturing their stories as millions escape violent conflicts and crushing poverty. 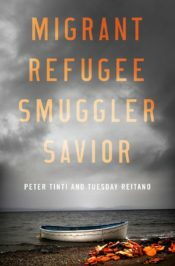 In Migrant, Refugee, Smuggler, Savior, Peter Tinti and Tuesday Reitano consider the smugglers involved in transporting migrants throughout Europe. Although many smugglers are viewed as saviors, others give little regard to the human rights issues. The excerpt below addresses how European policies limit asylum-seekers and lead them to depend on dangerous underground smuggling networks. Europe is currently experiencing the biggest mass migration since the Second World War in what has come to be known as the “migrant crisis.” There is a natural impulse—among scholars, journalists, politicians, activists, and concerned citizens—to frame their stories within a broader human rights narrative. They remind us of the unfairness of the world and the injustice of global inequality. What we want to focus on are the smugglers, traffickers, and networks of criminals that make their narratives possible. These networks, tens of thousands of people strong, are facilitating an unprecedented surge of migration from Africa, the Middle East, Central Asia, and South Asia into Europe. Although the drivers of the current “crisis” are many—including but not limited to the concentric phenomena of conflict, climate change, global inequality, political persecution, and globalization—the actualization of the crisis is enabled and actively encouraged by an increasingly professional set of criminal groups and opportunistic individuals that is generating profits in the billions. 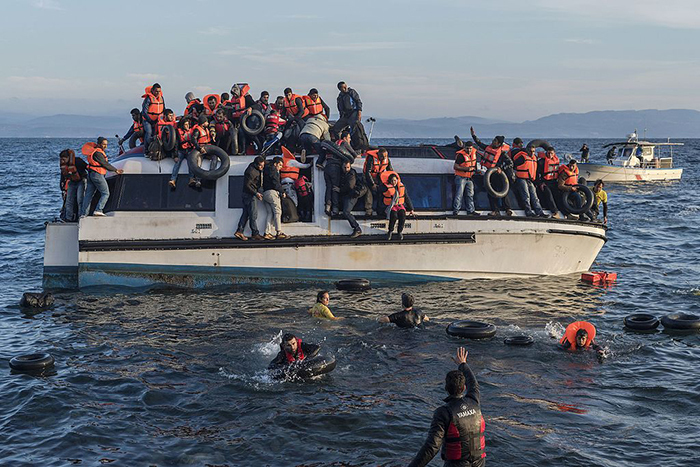 “Syrian and Iraqi refugees arrive from Turkey to Skala Sykamias, Lesbos island, Greece” by Ggia. CC BY-SA 4.0 via Wikimedia Commons. Some smugglers are revered by the people they transport, hailed as saviors due to their willingness to deliver men, women, and children to safety and opportunity when no legal alternatives will offer them either. In a neoliberal world where the fates of individuals are couched in anodyne policy-speak, it is often the criminals who help the most desperate among us escape the inadequacy, hypocrisy, and immorality that run through our current international system. It is certainly true that smugglers profit from the desperation of others, but it is also true that in many cases smugglers save lives, create possibilities, and redress global inequalities. Other smugglers carry out their activities without any regard for human rights, treating the lives of those they smuggle as disposable commodities in a broader quest to maximize profits. For all too many migrants and refugees, smugglers prove unable to deliver, exposing their clients to serious injury or even death. Even worse, some smugglers turn out to be traffickers, who, after luring unsuspecting clients with false promises of a better life, subject them to exploitation and abuse. Meanwhile, efforts by European policymakers and their allies to stem the flow of migrants into Europe are pushing smuggling networks deeper underground and putting migrants more at risk, while at the same time doing little to address the root causes of mass migration. In lieu of safe, legal paths to seeking refuge and opportunity, new barriers are forcing migrants to pursue more dangerous journeys and seek the services of more established mafias and criminal organizations. These groups have developed expertise in trafficking drugs, weapons, stolen goods, and people, and were uniquely qualified to add migrant smuggling to their business portfolios. The result has been a manifold increase in human insecurity, not only in the Mediterranean and Aegean Sea crossings, which have received considerable attention in the international media, but also along the overland smuggling routes that cross the Sahara and the Central Asian Silk Road, penetrate deep into the Balkans, and continue into the grimiest corners of Europe’s trendiest capitals. 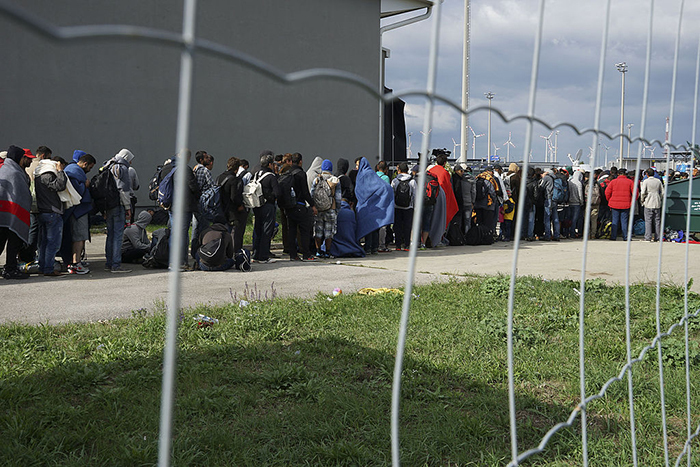 “A line of Syrian refugees crossing the border of Hungary and Austria on their way to Germany” by Mstyslav Chernov. CC BY-SA 4.0 via Wikimedia Commons. What was once a loose network of freelancers and ad hoc facilitators has blossomed into professional, transnational organized criminal networks devoted to migrant smuggling. The size and scope of their operations is unprecedented. Shadowy new figures have emerged, existing crime syndicates have moved in, and a range of enterprising opportunists have come forward, together forming a dynamic, multi-level criminal industry that has shown an extraordinary ability to innovate and adapt. What we are witnessing is not just the story of traditional migrant smuggling on a larger scale. Rather, we are witnessing a paradigm shift in which the unprecedented profits associated with migrant smuggling are altering long-standing political arrangements, transforming economies and challenging security structures in ways that could potentially have a profound impact on global order. Furthermore, the consolidation and codification of these networks also means that smuggling networks now seek to create contexts in which demand for their services will thrive. They have become a vector for global migration, quick to identify loopholes, exploit new areas of insecurity, and target vulnerable populations whom they see as prospective clients. They no longer simply respond to demand for smuggler services: they actively generate it. In order for governments, aid groups, and organizations to better understand how to help refugees, we must get beyond the facile and counterproductive narratives of villains and victims, and we must start by examining smugglers dispassionately for what they are: service providers in an era of unprecedented demand. Featured image credit: “Refugees on a boat crossing the Mediterranean sea” by Mstyslav Chernov. CC BY-SA 4.0 via Wikimedia Commons. Peter Tinti is an independent journalist and Senior Research Fellow at the Global Initiative Against Transnational Organised Crime. Formerly based in West Africa, his writing, reporting, and photography has appeared in The New York Times, The Wall Street Journal, Foreign Policy, Vice, among other outlets. Tuesday Reitano has been studying organized crime networks and their impact on governance, conflict and development for over 20 years, both in the UN System, and as the head of the Global Initiative Against Transnational Organised Crime, which she co-founded in 2013. She is based in Beirut, Lebanon. They are the authors of Migrant, Refugee, Smuggler, Savior (OUP, 2017).